Occasion Dress, Size 12 petite. Dark blue and black. Coldwater Creek. COLDWATER CREEK DRESS 10. PEACH LINING. CRISS-CROSS PLEATED WAISTBAND. SILK SEMI SHEER. LENGTH 48". FORAL PATTERN. In our society, people with disabilities live their lives being told what they can't do. Opportunity Village strives to break that stigma, encouraging the people it serves to follow their dreams. Color: Pink. Elastic Waist: 37-54". Length from top of shoulder to hem: 46-52". Hot pink and orange with tie sash in back. Dress is lined with polyester. 45" Length. Invisible Zipper in Back. Coldwater creek large black dress with fish motif maxi travel knit . Condition is Pre-owned. Shipped with USPS Priority Mail. Width: (armpit to armpit) 23 in. Length: 40 in. Width: (waist) 16 1/2 in. Floral Lace Around Neckline and Hem. Zipper Down the Back. 100% Cotton. White Color. 33% Rayon Approximately 50 inches long Final sale, as is, No returns Will ship to the address you have listed on your EBay/PayPal account. Via US Postal Service Priority Mail with tracking. In envelope. I appreciate your support, Thank You! Coldwater Creek Maxi Dress. Blue Paisley Print. 100% Rayon. Length: 60". Bust: 21" across. Coldwater Creek Blue Black & Gray Short Sleeve Belted Dress. Rear Zipper, lined top and belted. Armpit to armpit 21". Waist 16" and can stretch to 17 1/2". Length from back of neckline to hem 36". Coldwater Creek. This is a versatile, easy slip on dress by. 100% Cotton. 27" across bottom. 17" across waist. Freshly laundered and ready to wear. 50" shoulder to bottom. 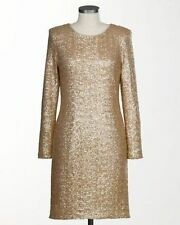 Occasion Dress, Size 12 petite. Dark blue and black. Coldwater Creek. . Condition is Pre-owned. Shipped with USPS Priority Mail. Ruching on the Front. Black, Brown, Orange, Red, Purple and Gray Colors. Floral Print. This is a lovely Casual career dress, Size 16P. It's "pre-owned" but is in excellent, like-new condition. It's a fully-lined, sheer polyester and it's made by Coldwater Creek. It has short, split flutter sleeves, a boat neck neckline, a hidden side zipper and a pleated waistband. Across Bust 21". Length (front shoulder to hem) 54". Across Waist 20". Ladies dresses size 16. Condition is Pre-owned. Shipped with USPS Priority Mail. Length 54 inchrs. Coldwater Creek DRess 16 Black Floral print short sleeve EUC. It is made of polyester, the top layer is sheer. It zips up the back. Condition is Pre-owned, excellent. My home is smoke free. Shipped with USPS First Class Package. Coldwater Creek sleeveless black & white check dress with red ribbon belt (size P12). Pre-owned, like new condition. From a smoke free home. This is a great dress in excellent condition that will be super comfortable. It has 8% spandex so lots of stretch. Order a Clean Out Bag and refresh your wardrobe. Earn a little cash or credit. Apparel Conversion Chart. 90% Polyester. Japan21 21.5 22 22.5 23 23.5 24 24.5 25 25.5 26 26.5 27 27.5 28. Our resale experts ensure there are no broken zippers or missing buttons. Body 91% polyamide/9% elastane. Lining 100% polyester. As seen in photo. Manufacturer: Coldwater Creek. Princess seams and flare bottom. It feels like cotton or cotton blend. Closure: Pull over head. Order a Clean Out Bag and refresh your wardrobe. Earn a little cash or credit. Apparel Conversion Chart. Our resale experts ensure there are no broken zippers or missing buttons. Shoe Conversion Chart. Shoulder to hem: 54". Waist: 18". Armpit to armpit: 20". COLDWATER CREEK. EMPIRE WAIST SEAM - TIES IN BACK. PURPLE FLORAL PRINT. LONG LENGTH DRESS. ROUNDED NECK. BUST- UNDERARM TO UNDERARM FLAT: 25". A-line look. This dress is a fairly narrow cut overall so check. Hang to dry. 17.5" straight across hip area. I really love this dress, I just don't. Blue and green floral watercolor pattern. 100% polyester. Colorblock Sheath Lined Dress. Coldwater Creek. Chest - 36". Sleeve- 0". Coldwater Creek shift dress. Beautiful crisp linen fabric. Flares at waist, A Line bottom. Wear this with a sweater or blazer for work or weekend. Very good condition. 55% Linen 45% Rayon. Black Buttons down front full length. Lovely reversible sleeveless polyester dress with a floral print on one side and a polka dot pattern on the other. Perfect for travel, as it's highly wrinkle-resistant and is like two dresses in one. This long dress features an overblouse in crinkle polyester, and taffeta lining with net in between the dress and the lining about 3/4 of the way down to give added fullness to the skirt. Gorgeous, rich purple polyester satin! 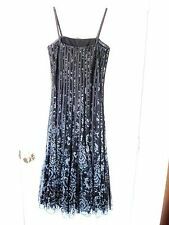 Coldwater Creek Women's maxi dress black and white size 10. Condition is Pre-owned. Shipped with USPS Priority Mail. Details: the top is made of polyester and spandex, the skirt is of cotton, skirt is fully lined, has boho print in black and white, the top has wrap kind of v neck, short sleeves. Skirt is large circle pattern, very pretty. Condition: excellent used condition Approximate measurement while laying it flat: Armpit to armpit 19" (fabric has stretch), waist 15", length 48". DRESS LENGTH 50". WAIST 19"x2 ( ELASTIC ON THE BACK). SHOULDER TO SHOULDER 14". Boning in the bodice. Zipper back. The ribbon is not attached, so can be tied in the front or back. Coldwater Creek Yellow Floral Dress Sz L. Condition is Pre-owned.